The DMC AFM8 can be easily mated to a military or non-military turret head, positioner, or adjustable head. 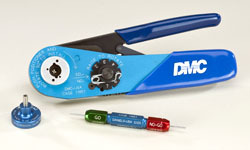 Once mated, this Upper Range Crimp Tool can be adjusted to match the diameter of the connector and wires desired. Because of this, connectors size 20 AWG to 32 AWG can be crimped correctly and precisely to wires for a professional and consistent connection. This causes a variety of applications to be available. 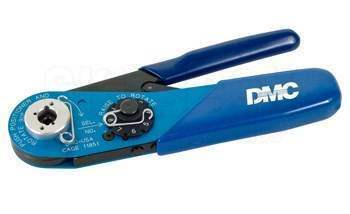 Depending on the attachment use and adjustments made, this crimp tool can be used on commercial installations, home maintenance, laboratory work, and heavy duty military or aerospace applications. Almost anything that requires electrical wiring or connection systems, such as the Deutsch connectors line of products, can use the AFM8 for their assemblies and ends. The ergonomic design of the AFM8 Crimp Tool makes it easy and painless to use. The handles are shaped and coated in a way that allows the user to crimp without stressing or straining their arm or hand, providing minimal resistance and a reduced chance for muscle strain. This allows for repeated use in any environment without tiring the user or causing injury. In addition, the light weight design makes it easy to transport and carry, allowing for wire crimping in the field and on any installation project and at many different heights and angles. Also, no operator maintenance beyond proper storage and occasional cleaning is required for the tool to continually function properly. So whether on the work site or in a workshop, this tool will fit your occasional or consistent needs alike. Deutsch Connectors are used on a huge variety of applications: aerospace, transportation, automotive, heavy machinery, and much more. Government contractors, independent companies, and hobbyists alike rely on Deutsch for any plugs, connectors, and pins used in electronics. For solid connectors used in these application, the AFM8 Crimp Tool can be used to match up wires with their proper Deutsch connectors, allowing compatibility with the Deutsch common contact system and other Deutsch products. The 8-pin crimp that this tool creates is the ideal crimping connection for connectors of any size and application as it gives maximum connection strength and the cleanest termination. With the AFM8, you'll never need to stress or do extra work to repair a bad crimp or damaged connection.